C. N. Dagger – U.S. Deputy Marshal commissioned in the Southern District at Paris, Texas serving under Marshal Sheb Williams. On November 1, 1890, a dispatch was received from Vernon, Texas stating that Dagger had been shot in Kiowa and Comanche country and was in dire need of assistance. Crawley P. Dake (1827-1890) – Union soldier during the Civil War and U.S. Marshal for Arizona Territory from 1878 to 1882. Dake was born in Ontario, Canada in 1827 (some publications indicate 1836) but moved with his family to Ogdensburg, New York when he was a child. When he grew up he operated a retail store in Michigan but when the Civil War broke out, he raised a company of soldiers and was commissioned in the 5th Michigan Cavalry. He served at Gettysburg and in several other major actions until he was wounded and retired as a major in August, 1864. He then worked for the Internal Revenue Service for a time before being appointed as the U.S. Marshal for Arizona Territory on June 12, 1878. For the first two years, he dispatched a number of posses to the Mexican border, attempting to control the lawlessness taking place there. Working for him were a number of well known frontier characters including Leslie Blackburn, Virgil and Wyatt Earp, Joseph Evans, Joe Phy and others. After the Gunfight at the O.K. Corral in Tombstone, Arizona in October, 1881, he was heavily criticized and replaced in July, 1882. 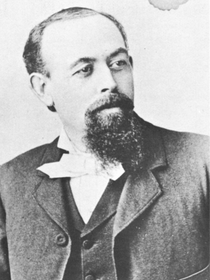 He remained in Arizona, living in Prescott, managing mining and business interests until his death on August 9, 1890. Frank Dalton (1859-1887) – The older brother of the boys who formed the Dalton Gang, Frank was a U.S. Deputy Marshal at Fort Smith, Arkansas. Involved in a number of gunfights during his short career, he was killed, along Deputy J.R. Cole in 1887 by a man named Dave Smith. Grattan “Grat” Dalton (1865-1892) – A member of the deadly Dalton Gang, Grat was first a U.S. Deputy Marshal before he chose a life a crime — a decision that would get him killed in the Coffeyville Raid. Edwin B. Daniels (18? ?-1874) – A deputy sheriff in St. Clair County, Missouri, Daniels was traveling with Pinkerton Agents, Louis Lull and James Boyle, searching for the elusive Younger brothers, who were thought to be in the area. On March 16, 1874, they set out from Osceola to Roscoe, Missouri. After spending the night at the Roscoe House Hotel, the left the day for the home of Theodrick Snuffer, a family friend of the Youngers, some three miles out of town. Posing as cattle buyers, they questioned Snuffer, but got nowhere. Little did they know that John and Jim Younger were watching from Snuffer’s attic. When the lawmen left, the two Younger Brothers followed and ordered the three men to halt. Panicked, Pinkerton Agent James Wright, spurred his horse and kept on going. However; the other two lawmen, Pinkerton Agent Lull and Daniels, stopped and within no time a gunfight ensued. When the smoke cleared, John Younger and Deputy Edwin Daniels were dead, Louis Lull was severely wounded and Jim Younger received a flesh wound in his hip. Lull was taken to Roscoe for treatment, but later died of his wounds. John Davis – A U.S. Deputy Marshal in Indian Territory. On August 1, 1895, he tracked Sam Butler, a wanted murderer and member of the Cook Gang, to the Verdigris River and when he tried to arrest the fugitive, Butler began to fire his gun. Davis fell mortally wounded but fired one last shot, killing Butler instantly. Lon Davis – U.S. Deputy Marshal commissioned in the Muskogee Court in 1898, serving under Marshal Leo Bennett. In 1898, Lon worked with U.S. Deputy Marshals Bud Ledbetter, Dave Adams, Bill Barker and Harry Adams, to close down a number of gambling operations in Sapulpa, Oklahoma and arrested the Hughes Gang in Bristow. When the gang of three brothers refused to surrender without a fight, and one of them was killed. On May, 1905, while Davis was trying to arrest a drunken man named Will Dunn, who was disturbing the peace in Sawyer, Oklahoma, the drunken fool refused and when the guns began blazing, Dunn was killed. Ollie “Big Nose George” Deetz (1850-1889) – Deetz became the marshal of Manhattan, Colorado in May, 1887. Manhattan was a gold mining camp in the foothills of the Rocky Mountains in northwestern Larimer County. Like other mining camps of the time, it had a lawless element and city authorities hired Deetz to “get rid of it.” He seemingly happily complied, killing three men his first night on the job and collecting a $100 bounty on each man. He continued to “rid” the town of its seedier characters, hanging some of them after planting evidence. A year later he moved northward to Wyoming, and following an alleged bank robbery, he was lynched at Rock Creek on October 5, 1889. George DeLaughter -U.S. Deputy Marshal commissioned in the Western District at Fort Smith, Arkansas. He rode in a posse led by Columbus Ayers in October, 1883, which arrested Johnson Jacks, who had been charged with murdering U.S. Deputy Marshal Addison Beck. Cyrus Dennis – U.S. Deputy Marshal commissioned in the Western District court under Marshal John Carrol out of Fort Smith, Arkansas. He also served as a Seminole Lighthorsemen in the Indian Police for twenty-five years. Donald H. “John” Dillingham (1837-1863) – Born in Philadelphia, Pennsylvania, Dillingham received a good education before making his way west when he grew up. Landing in Bannack, Montana, he was named a deputy under Sheriff Henry Plummer, along with three other men named Charley Forbes, Buck Stinson and Jack Gallagher. However, these other three deputies were little more than outlaws masquerading as lawmen. Dillingham was an honest man and when he heard of plans to rob travelers along the roads, he was known to warn the intended victims. As a result, he was shot down in Virginia City, Montana on June 26, 1863 by Deputies Charley Forbes, Buck Stinson and another man named Hayes Lyons. Though the killers were arrested and tried in a miners’ court, with several witnesses to the murder, they were acquitted. This incident was just one of many that prompted the organization of vigilante groups in Montana. Henry W. Dixon – U.S. Deputy Marshal commissioned in 1872 in the Western District at Fort Smith, Arkansas serving under Marshal Logan S. Roots. He first lived Scott County, Arkansas while he worked in the Western District Court, but in 1887 was assigned to the Southern District of Indian Territory, located in Paris, Texas, working under Marshal Thomas B. Needles.